Accusonus ERA-D is a powerful and flexible tool that can suppress unwanted noise and reverberation in audio recordings. The problem of noise suppression in audio recordings is a common one. There exist many noise reduction tools, offering different flavors of processing. Many products feature a variation of the ``noise-learning'' trick, where the user is asked to highlight a portion of the signal, identify it as noise and inform the algorithm accordingly. The problem of removing unwanted reverberation is quite common as well, but it's only in recent times that technology has allowed engineers to begin addressing it. In practice, all audio recordings feature both noise and reverb in varying degrees, interacting in a complex way that defies traditional modeling approaches. With ERA-D, our goal is to tackle noise and reverb as a single type of interference, covering all types of real-world restoration scenarios. ERA-D features two suppression engines that can be used in mono, stereo or enhanced stereo mode. The denoise module is a fully adaptive processor (i.e. no need for ``noise-profiling''), that yields impressive results in a wide range of cases. The dereverberation module is a state-of-the-art design, developed with transparency and efficiency in mind. The real meat though are the ``joint'' operation modes, where the two processing modules work in tandem, guided by a unified estimation model. On top of that, ERA-D offers great creative freedom, allowing the user to interact with the DSP engine in a multitude of meaningful ways. Signal Path , where the user can select his/her preferred operation mode: denoise only, dereverberation only, cascade (serial) combination, parallel combination. 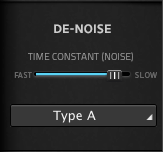 De-noise , featuring all the necessary controls to reduce noise amount. De-reverberation , featuring all necessary controls for reverb suppression. 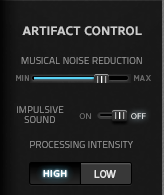 Artifact Control is a post-processing module, used to polish the sound and reduce unwanted artifacts (``musical noise''). Graph is a frequency domain representation of the most important signals flowing through the engine of ERA-D. Band controls are overlaid on the graph, allowing for detailed processing in specific ranges. Output , where the user can apply gain and select his/her preferred monitoring configuration. Most modules have an ``advanced'' options panel, for deeper customization. 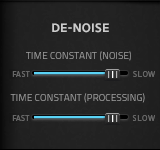 De-Noise: Only the denoise engine is used. In this mode, ERA-D functions as an adaptive noise suppression tool. Useful in noisy audio recordings captured outdoors, in dry rooms, or DI recordings. 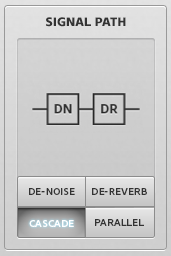 De-Reverb: Only the dereverberation engine is used. ERA-D functions as a reverb suppression tool. Useful in clean recordings with prominent room coloration. Cascade: This is the first of two ``joint'' processing modes. In this mode, both denoise and dereverberation engines are active. The input signal is processed by both modules serially (denoise occurs first and dereverberation after). The important thing to note here is that the two modules share common estimation and adaptation data. This mode can get extreme, but it can also produce astonishing results at the right settings. Useful in any audio recording that has both noise and room reverberation. Parallel: This is the second combined mode. As the name and the diagram on the GUI suggest, the denoise and dereverberation engines are active in parallel. The final processing applied is the sum of each module's contribution. When this mode is selected, a fader appears, allowing the user to tweak the processing balance between noise and reverb suppression. This mode is usually less drastic than Cascade. Useful in audio recordings with noise and room reverberation. NOTE: The Cascade and Parallel modes are unique to ERA-D and are not equivalent to having two separate (denoise and dereverberation) plugins in your DAW. ERA-D's processing engines are aware of each other's estimations, form a complete integrated system and adapt their performance accordingly. NOTE: Keep in mind that each Signal Path option offers a dramatically different sound. The same suppression settings will not necessary translate well when changing Signal Path configuration. The Denoise module is responsible for all tasks related to noise suppression. There are two types of operation here (similar to the Dereverberation module, which will be explained next): single and dual. An important distinction must be made: single/dual are not directly equivalent to mono/stereo . Single: When ``Single'' is active, each channel is processed separately by an instance of the engine. This mode is compatible with both mono and stereo signals, resulting in mono and dual-mono operation respectively. This setting produces predictable results and is a good starting point for all types of signals. Dual: The ``Dual'' setting is a more sophisticated and specialized type of processing, usually suitable for stereo signals with a relatively high degree of difference between left and right. In this mode, the algorithm will attempt to respond to channel energy distribution in an intelligent way. TIP: The Dual mode is ideal for recordings done with a primary and a secondary microphone (think for example main and camera mic). The Dual mode will take advantage of secondary mic information, in order to enhance the sound of the main mic. 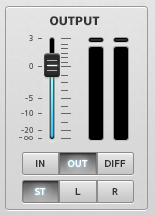 Generally speaking, use this mode to deal with tracks that have uneven interference across the left and right channel. On the other hand keep in mind that it's not recommended to use the Dual mode with mono (or dual mono) tracks. Adapt: Press this button to ``reset'' the algorithm's memory and force it to re-adapt to the current input. The Adapt button works instantly (no need to keep it pressed). 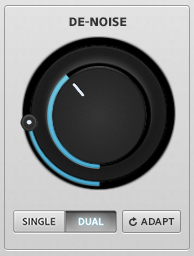 TIP: The Adapt button is very useful when you need to process audio files with different noise profiles, using the same plugin instance. This for example can happen when you place different recordings along the same track of your DAW. Press Adapt between files, to make sure that ERA-D clears its prior knowledge and resets all estimations. Main Denoise Control: Turn the knob clockwise to reduce noise. When ``Dual'' operation is on, the outer concentric ring controls noise reduction based on the cross-channel estimation of noise. When either knob is set to zero, no processing is applied. Time Constant (Noise): This control affects the speed at which the algorithm adapts to noise changes. Slower settings are good enough for most cases and will produce a smooth result. Faster settings may be more suitable in material with non-uniform interference. Time Constant (Processing): This control is available in Dual mode and affects the general adaptation speed of the noise suppression engine. Slower values usually produce a smoother sound. Type: Choose between three flavors of noise reduction (A, B and C). Each type corresponds to a different mathematical formula used to determine noise energy in the signal. Type A is the default type. Type B offers a slightly more prominent effect. Type C is the most subtle setting of all. Keep in mind that differences here can be very subtle. While this option will not usually have a great impact on the sound, it is nevertheless available as an additional way to handle special cases. The Dereverberation module works similarly to the Denoise module. Dual: The ``Dual'' setting is a more sophisticated and specialized type of processing, suitable for stereo signals with a relatively high degree of difference between left and right. In this mode, the algorithm will attempt to respond to channel energy distribution in an intelligent way. Main Dereverb Control: Turn the knob clockwise to reduce reverberation. When ``Dual'' operation is on, the outer concentric ring also reduces reverb based on the cross-channel reverb estimations. The advanced dereverberation controls allow the user to tweak the engine's response across the frequency range. As a rule of thumb, the low frequency time constant should be slower than the high frequency one (as in principle low frequencies travel slower than high frequencies). Both are related to the apparent reverb time of the input signal. Time Constant (Reverb) - LF: This control affects the speed at which the algorithm adapts to reverb changes in lower frequencies. Time Constant (Reverb) - HF: This control affects the speed at which the algorithm adapts to reverb changes in higher frequencies. TIP: Depending the settings and the recording, the de-reverb module might also reduce the ambient noise: this is intended behaviour. In many cases, ambient noise presents some similar acoustic characteristics with reverb and therefore a dereverberation approach might be a perfect candidate for denoising too. Intensive processing in the frequency domain comes at a cost. The type of filtering specifically applied by noise and reverb suppressors produces ``musical noise'', a type of artifact otherwise known among mixing engineers and producers as ``wobbly'' or ``liquid'' sound. During the development of ERA-D we have gone to great lengths to ensure minimal appearance of such unwanted side effects. In case of extreme settings though, or when dealing with extremely noisy material, artifacts are practically unavoidable. The Artifact Control section helps alleviate this problem. Artifact Control On / Off: Turn artifact control on or off. Musical Noise Reduction: This slider controls the amount of smoothing applied in order to suppress musical noise. Impulsive Sound: Use this switch to engage a second smoothing algorithm, sometimes suitable for impulsive or percussive material. Processing Intensity: Toggles the global processing intensity setting. Default is set to ``High'', which provides the ideal range for most typical cases. Using the ``Low'' setting has the benefit of finer control, at the expense of less processing overall. Noise (purple): Noise distribution across frequencies. This option reveals the inner workings of the Denoise module. Use this to see what ERA-D considers ``noise''. Reverb (green): Reverb distribution across frequencies. Similar to the noise plot, this option reveals the current estimation of the Dereverberation module. Fusion (orange): Joint noise/reverb estimation. This option is meaningful when one of the two joint Signal Path modes are selected (Cascade or Parallel) and reveals the combined estimation of the Denoise and Dereverberation modules. Dry (yellow): The unprocessed input. Wet (pink): The processed output. ERA-D features multi-band post-processing, allowing the user to make informed decisions on particular frequency ranges. You can configure crossover frequencies by mouse-dragging the band-edges (vertical lines). An important note: The multi-band effect is applied after the basic Denoise and Dereverberation controls . The single/dual suppression controls (the large knobs) in each module are wide-band, affecting the entirety of the spectrum. Use the multiband controls to tune each module's contribution to each band. Range: Determines the level at which processing occurs in the specific band. Drag the Range control down to increase processing. If all ranges are set to 0 (all the way up), no processing will be applied (even if Denoise and Dereverberaton module controls are active).Intensity: A non-linear parameter that adjusts processing intensity in the specific band. The Intensity control takes into account the algorithm's ``confidence'' in noise-reverb estimations. When turned clockwise, frequency ranges with ``strong'' estimations (i.e. ranges where noise or reverb are more prominent) are further suppressed. Intensity default value is at 50%. When turned counter-clockwise, intensity may reach 0% where no processing at all occurs.Solo: Solo the band for previewing. TIP: ERA-D offers a multitude of ways to approach denoise/dereverberation. You have the main module controls, the Ranges and the Intensities at your disposal. There is no single ``best'' or ``intended'' workflow. Keep in mind that if any of the above parameters are at zero, the rest are nullified and no processing occurs. Link: When Link is on, band parameters are grouped.Advanced: Press this button to show the advanced settings. Apart from the familiar output gain slider, the Output section features some very handy monitoring options. You can monitor dry, wet and difference signals for any channel. In / Out / Diff: Switch between unprocessed, processed and difference signals. Listening to the difference signal reveals the signal portion being removed by ERA-D.ST / L / R: Use this switch to monitor the complete stereo signal or a single channel. TIP: The Diff monitoring option can be very helpful to empirically determine the extent of processing. Here are some usage examples. These are intended to show some of the possibilities and are neither the only, nor necessarily the best ways to deal with a situation . Start with all Ranges all the way up (no processing) and Intensities in the middle. 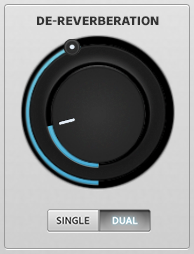 Turn the main Denoise knob until it's between 1/2 and 3/4. Start lowering the Ranges and listen to the effect. Start with all Ranges all the way down (maximum) and Intensities in the middle. Turn the main Dereverb knob clockwise and listen to the effect. Work the Dereverberation knob until you get similar results.